JoForm embeded Code is cut off on my website, I use Zenfolio. 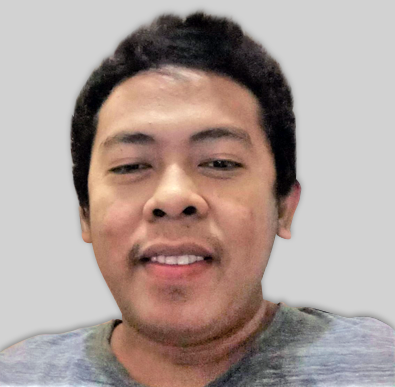 I try to insert Jotform in my website (Zenfolio web developer) but the form cut off, I am not sure if the problem is Zenfolio, any help is appreciated. Thank you for contacting us. May we request for the site URL so that we can further check on what's causing the issue. By the way are you trying to view it using a browser or a mobile device? I have changed the browser, from Fire Fox to Chrome and then to Safari, and always the same thing, I have contacted Zenfolio but they said they don't look at any embed code from third party, so I don't know what to do, the link is: http://www.braulyphotography.com/order. Try to re-embed your form using iframe embed code. See if this helps: How to get your iFrame Embed Code. 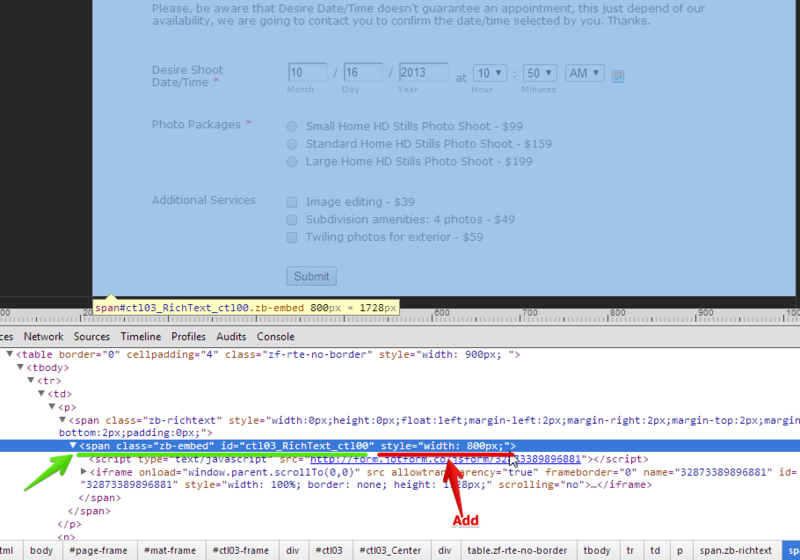 Please, there is something I would like to be clarified, if I specified width 800 in the style form before generate the embed code (something that I was doing since the beginning), save and run, then in the iFrame show width: 100%, Why not the Jotform update to the right number in the first place? It means that I have to fix the width in the iFrame every time I update my forms? CSS styling is just an additional styling for your forms and doesn't really affect the internal code generated by the system. I think this doesn't answer my concern. 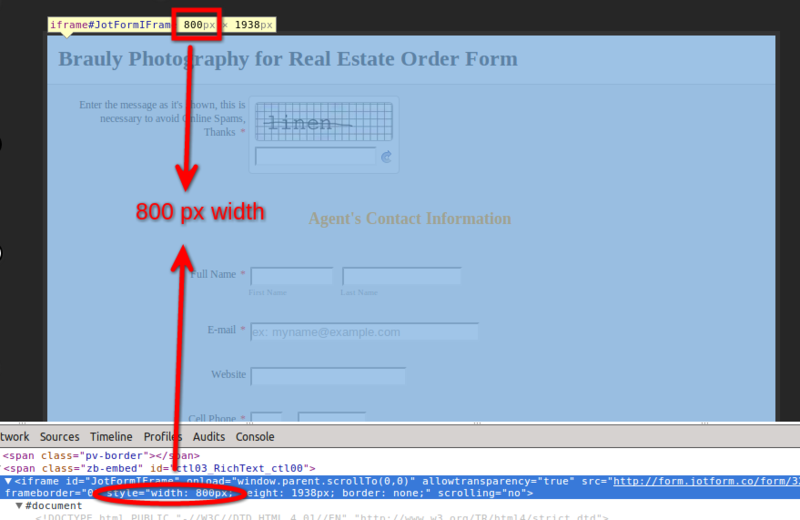 the width="%100 refers to use the whole width of the form 800px in your case as the width of the iframe. Zenfolio was doing the same thing for me. I was using the Embed function to put in the Iframe code. To fix this, I just pasted the iframe code in as html without using the embed function. Works perfectly! i used iframe and copied in as html and it is now working. thanks everyone!!! Depending on the support request's number the support is not immediate but we still have a good response time. I'm glad that everything is working now. If you need further support please let us know on a separate thread or by updating the ones already created by you. We do our best to provide a reply on a timely manner, but our forum is also made in a way that is like a data base for other users to search solutions for their problems, so it's good to know that you still got a solution from us.